Oracle GoldenGate (GoldenGate) is used to collect, replicate, and manage transactional data between databases. It is a log-based change data capture (CDC) and replication software package used with Oracle databases for online transaction processing (OLTP) systems. GoldenGate creates trail files that contain the most recent changed data from the source database and then pushes these files to the target database. You can use GoldenGate with Amazon RDS for Active-Active database replication, zero-downtime migration and upgrades, disaster recovery, data protection, and in-region and cross-region replication. You are responsible for setting up and managing GoldenGate for use with Amazon RDS. You are responsible for managing GoldenGate licensing (bring-your-own-license) for use with Amazon RDS in all AWS regions. For more information, see Oracle Licensing. Amazon RDS supports GoldenGate for Oracle Database Standard Edition Two (SE2), Standard Edition One (SE1), Standard Edition (SE), and Enterprise Edition (EE). Amazon RDS supports GoldenGate for database version 11.2.0.4, 12.1.0.2, or 12.2.0.1. Amazon RDS supports GoldenGate version 11.2.1 and later, including 12.1, 12.2, and 12.3. Amazon RDS supports migration and replication across Oracle databases using GoldenGate. We do not support nor prevent customers from migrating or replicating across heterogeneous databases. 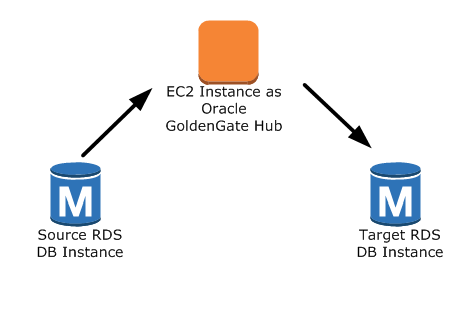 You can use GoldenGate on Amazon RDS Oracle DB instances that use Oracle Transparent Data Encryption (TDE). To maintain the integrity of replicated data, you should configure encryption on the GoldenGate hub using EBS encrypted volumes or trail file encryption. You should also configure encryption for data sent between the GoldenGate hub and the source and target database instances. Amazon RDS Oracle DB instances support encryption with Oracle Secure Sockets Layer or Oracle Native Network Encryption. GoldenGate DDL is supported with GoldenGate version 12.1 and later when using Integrated capture mode. The GoldenGate architecture for use with Amazon RDS consists of three decoupled modules. The source database can be either an on-premises Oracle database, an Oracle database on an EC2 instance, or an Oracle database on an Amazon RDS DB instance. 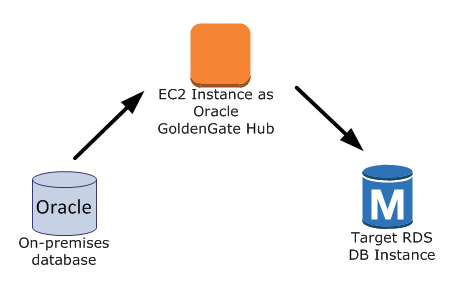 Next, the GoldenGate hub, which moves transaction information from the source database to the target database, can be either an EC2 instance with Oracle Database 11.2.0.4 and with GoldenGate 11.2.1 installed, or an on-premises Oracle installation. You can have more than one EC2 hub, and we recommend that you use two hubs if you are using GoldenGate for cross-region replication. Finally, the target database can be either on an Amazon RDS DB instance, on an EC2 instance, or on an on-premises location. Scenario 1: An on-premises Oracle source database and on-premises GoldenGate hub, that provides data to a target Amazon RDS DB instance. Scenario 2: An on-premises Oracle database that acts as the source database, connected to an Amazon EC2 instance hub that provides data to a target Amazon RDS DB instance. Scenario 3: An Oracle database on an Amazon RDS DB instance that acts as the source database, connected to an Amazon EC2 instance hub that provides data to a target Amazon RDS DB instance. 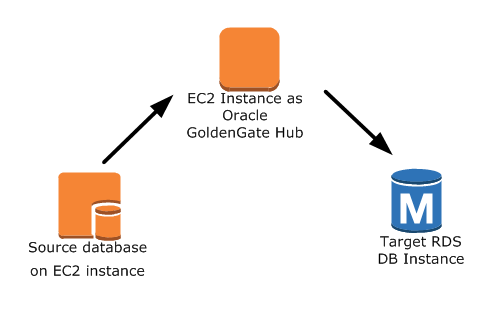 Scenario 4: An Oracle database on an Amazon EC2 instance that acts as the source database, connected to an Amazon EC2 instance hub that provides data to a target Amazon RDS DB instance. Scenario 5: An Oracle database on an Amazon RDS DB instance connected to an Amazon EC2 instance hub in the same region, connected to an Amazon EC2 instance hub in a different region that provides data to the target Amazon RDS DB instance in the same region as the second EC2 instance hub. Any issues that impact running GoldenGate on an on-premises environment will also impact running GoldenGate on AWS. We strongly recommend that you monitor the GoldenGate hub to ensure that EXTRACT and REPLICAT are resumed if a failover occurs. Since the GoldenGate hub is run on an Amazon EC2 instance, Amazon RDS does not manage the GoldenGate hub and cannot ensure that it is running. You can use GoldenGate using Amazon RDS to upgrade to major versions of Oracle. For example, you can use GoldenGate using Amazon RDS to upgrade from an Oracle version 8 on-premises database to an Oracle database running version 11.2.0.4 on an Amazon RDS DB instance. There are several steps to creating a GoldenGate hub on an Amazon EC2 instance. First, you create an EC2 instance with a full installation of Oracle DBMS 11g version 11.2.0.4. The EC2 instance must also have GoldenGate 11.2.1 software installed, and you must have Oracle patch 13328193 installed. For more information about installing GoldenGate, see the Oracle documentation. Since the EC2 instance that is serving as the GoldenGate hub stores and processes the transaction information from the source database into trail files, you must have enough allocated storage to store the trail files. You must also ensure that the EC2 instance has enough processing power to manage the amount of data being processed and enough memory to store the transaction information before it is written to the trail file. Add the following entry to the tnsname.ora file to create an alias. For more information on the tnsname.ora file, see the Oracle documentation. Next, create subdirectories in the GoldenGate directory using the EC2 command line shell and ggsci, the GoldenGate command interpreter. The subdirectories are created under the gg directory and include directories for parameter, report, and checkpoint files. Once you have completed these steps, the GoldenGate hub is ready for use. Next, you set up the source and target databases. Set the compatible parameter to 11.2.0.4 or later. Set the ENABLE_GOLDENGATE_REPLICATION parameter to True. This parameter turns on supplemental logging for the source database. If your source database is on an Amazon RDS DB instance, you must have a parameter group assigned to the DB instance with the ENABLE_GOLDENGATE_REPLICATION parameter set to true. For more information about the ENABLE_GOLDENGATE_REPLICATION parameter, see the Oracle documentation. Set the retention period for archived redo logs for the GoldenGate source database. Create a GoldenGate user account on the source database. Grant the necessary privileges to the GoldenGate user. Always retain the parameter group with the compatible parameter. If you restore an instance from a DB snapshot, you must modify the restored instance to use the parameter group that has a matching or greater compatible parameter value. This should be done as soon as possible after the restore action and will require a reboot of the instance. The ENABLE_GOLDENGATE_REPLICATION parameter, when set to True, turns on supplemental logging for the source database and configures the required GoldenGate permissions. If your source database is on an Amazon RDS DB instance, you must have a parameter group assigned to the DB instance with the ENABLE_GOLDENGATE_REPLICATION parameter set to true. For more information about the ENABLE_GOLDENGATE_REPLICATION parameter, see the Oracle documentation. The duration for log retention is specified in hours. The duration should exceed any potential downtime of the source instance or any potential communication/networking issues to the source instance, so that GoldenGate can recover logs from the source instance as needed. The absolute minimum value required is one (1) hour of logs retained. ERROR OGG-02028  Failed to attach to logmining server OGG$<extract_name> error 26927 - ORA-26927: altering an outbound server with a remote capture is not allowed. Because these logs are retained on your DB instance, you need to ensure that you have enough storage available on your instance to accommodate the log files. To see how much space you have used in the last "X" hours, use the following query, replacing "X" with the number of hours. GoldenGate runs as a database user and must have the appropriate database privileges to access the redo and archive logs for the source database, so you must create a GoldenGate user account on the source database. For more information about the permissions for a GoldenGate user account, see the sections 4, section 4.4, and table 4.1 in the Oracle documentation. CREATE USER oggadm1  IDENTIFIED BY "XXXXXX"
Set the ENABLE_GOLDENGATE_REPLICATION parameter to True. If your target database is on an Amazon RDS DB instance, you must have a parameter group assigned to the DB instance with the ENABLE_GOLDENGATE_REPLICATION parameter set to true. For more information about the ENABLE_GOLDENGATE_REPLICATION parameter, see the Oracle documentation . The GoldenGate utilities EXTRACT and REPLICAT work together to keep the source and target databases in sync via incremental transaction replication using trail files. All changes that occur on the source database are automatically detected by EXTRACT, then formatted and transferred to trail files on the GoldenGate on-premises or EC2-instance hub. After initial load is completed, the data is read from these files and replicated to the target database by the REPLICAT utility. The EXTRACT utility retrieves, converts, and outputs data from the source database to trail files. EXTRACT queues transaction details to memory or to temporary disk storage. When the transaction is committed to the source database, EXTRACT flushes all of the transaction details to a trail file for routing to the GoldenGate on-premises or EC2-instance hub and then to the target database. Configure the EXTRACT parameter file on the GoldenGate hub (on-premises or EC2 instance). The following listing shows an example EXTRACT parameter file. The REPLICAT utility is used to "push" transaction information in the trail files to the target database. Configure the REPLICAT parameter file on the GoldenGate hub (on-premises or EC2 instance). The following listing shows an example REPLICAT parameter file. Using the ggsci command line, add a checkpoint table. Note that the user indicated should be the GoldenGate user account, not the target table schema owner. The following example creates a checkpoint table named gg_checkpoint. This section explains the most common issues when using GoldenGate with Amazon RDS. for sequence 1306Not able to establish initial position for begin time 2014-03-06 06:16:55.